On a cold day, and with hearty fare for dinner, the wine I want the most is a glass of big, bold Zinfandel. The food I enjoy cooking in the fall/winter just screams out for a Zinfandel, such as beef stroganoff, roast lamb, beef stew….yum! 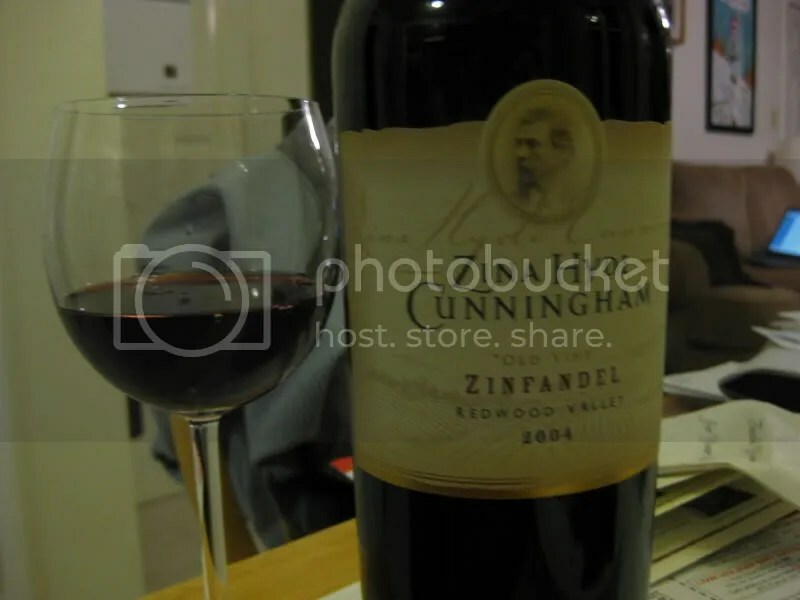 Tonight I chose the 2004 Zina Hyde Cunningham Zinfandel. It had a real cork closure, clocked in at 15% alcohol by volume, and cost us $28 when we visited the winery last Spring. On the nose I found blackberry, licorice, figs and boysenberry. It almost smelled kind of Port-like to me. Surprising, but pleasant, and worked well the roast we had for dinner! In the mouth, I got flavors of milk chocolate, spice, blackberries, plums, black currant, and black cherry. The wine had an absolutely gorgeous flavor that gave up loads more fruit and complexity than the nose. Overall, the wine was deliciously smooth and integrated. While the nose was pleasant, the mouth just made this an excellent wine. I loved it, and I think I’ll hang onto my second bottle for another year or so and see what’s it up to then. 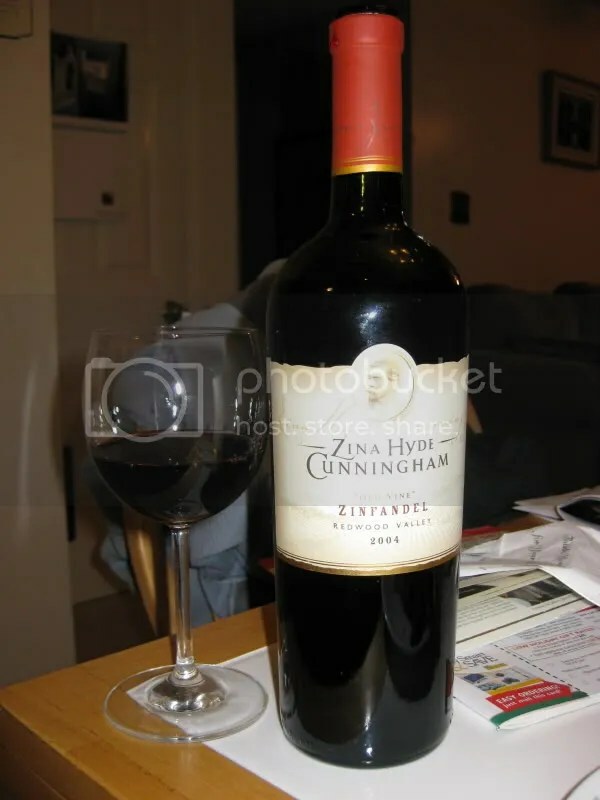 The wine for the evening was the 2004 Zina Hyde Cunningham Petite Sirah. It hails from Lake County, clocks in at 14.9% alcohol by volume, and cost us $24 at the winery last March. I have another bottle of this wine hanging out in the cellar and it is going to be tough to now pop the cork on it soon, it’s such a tasty wine! I first noted the color on the wine, a deep dark inky purple, classic Petite Sirah. The nose smelled of blackfruit, gobs of blueberry, blackberry, spice, baking spice, chocolate, and anise. Roll it altogether and you’d have a pretty darn tasty pie. In the mouth, the tannins dominated. This needed air, so I quickly pulled out our decanter to give this one some help. After some time in the decanter, the flavor showed all blueberries, all the way. I even wrote down blueberries three times in my notes, and underlined it, and put exclamation points next to it. I think I wanted to remember that this one was full of blueberries. Behind the blueberries I found undertones of red berries, spice, clove, anise, chocolate, vanilla, and chocolate covered cherries. The wine smoothed beautifully fairly quickly, however, my first tasting note for this one was “Hello tannins.” So you are definitely going to want to give this one some time to air or try to save it for a few a years…I’ll try, I promise. As we were drinking it, I kept thinking back to the blind tasting of Petite Sirah I hosted when it was my turn to host Wine Blogging Wednesday. This wine would have placed extremely well in the tasting in my opinion. Overall, a delicious, tannic, beast of a Petite Sirah, perfect for those who love this wild grape. We stopped at Zina Hyde Cunningham on our first day in California. Several of the other wineries recommended them, so we made it our last stop on our way back to town. 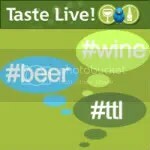 I didn’t take any pictures for some reason, or if I did, I can’t find them, so the image is from the winery’s website. The tasting room was great inside, it had a huge tasting bar, plenty of room to meander about, and we were the only people there, so it was great to have the place all to ourselves! 2005 Russian River Sauvignon Blanc: $18. Melon, pineapple, tart, acidic, good. 2005 Pinot Noir: $40. Syrupy, cherry, plum, spice, light flavors. 2004 Redwood Valley “Old Wine” Zinfandel: $28. Made from 100 year old vines. Berries, peppery, raspberry, tasty. 2004 Lake County Petite Sirah: $24. Chocolate, blueberry, spice, lots of berries. We took home 2 bottles. 2004 Redwood Valley Zinfandel Reserve: Brown sugar, less fruit, berries. 2004 Lake County ‘Cepage’: $34. 44% Merlot, 40% Cabernet Sauvignon, 4% Cabernet Franc, 9% Malbec, 3% Petite Verdot. Caramelized sugar, dark fruit, very tannic. I wanted to take home the Sauvignon Blanc and the Old Vine Zin as well as the Petite Sirah, but since it was the end of the day and I had already way blown the budget for the day, I had to settle for just the Petite Sirah, which was actually my favorite Petite Sirah from the whole trip!